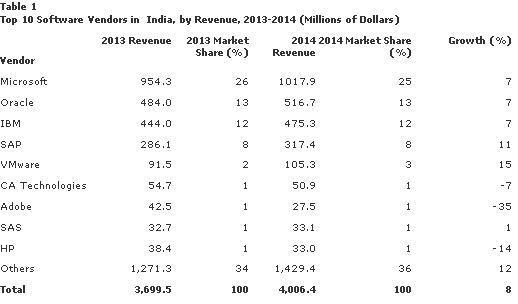 Compared to India's software services market which is estimated to be in the range 100 billion US$, the software product market (both domestic consumption and exports) in India is in the range of 6 billion US$s. In services India's export is higher than imports, where as in software products the imports is higher than the exports. The good news is software product business in India is growing faster. Gartner in its latest study has reported India's software revenue totaled $4 billion in 2014, an 8.3 percent increase from 2013 revenue of $3.7 billion. The most popular software product used in industry as well as personal purpose is Computer Operating System, mainly Windows OS from Microsoft. That's the reason for Microsoft to top the list with 25 percent followed by Oracle, and IBM, which altogether takeaway 50 percent of total software sales in India.